Centralized repository for data pertaining to merchant vessel designs available from German civil shipyards. While construction of vessels under the programme would be spread among many shipyards, three firms were designated as lead yards responsible for the detailed design and construction parameters, and the need for uniformity in construction was stressed. The Flensburger Schiffbau-Gesellschaft AG of Flensburg was assigned the responsibility to prepare the Typ A design; the “Neptun“ Schiffswerft und Maschinenfabrik AG of Rostock was assigned the Typ B design; and the Deutsche Schiff- und Maschinenbau AG of Bremen was assigned the Typ C design. 410 tons miscellaneous weight reserved for deck cargo, modifications etc. 750 tons miscellaneous weight reserved for deck cargo, modifications etc. 920 tons miscellaneous weight reserved for deck cargo, modifications etc. Breakdown - 1,700 tons high-stowed cargo; 300 tons accounted for by deck handling gear. The design of the Europa class river-sea freighter has been framed to meet the requirements of the Erste Donau-Dampfschiffahrts-Gesellschaft for operation on the river Danube, but it meets the parameters for operation on the navigable rivers of western and northern Germany, including the Rhine, the Mosel, the Weser, the Elbe and the lower reaches of the Oder. The design will also conform to the requirements of the planned Rhine-Main-Danube canal. The design is also capable of short-sea voyages in the Black Sea, the North Sea and the Baltic. Crew complement and survivability reduced to account for commercial service. The Ostland class motor coaster was designed for service in the Baltic and North Sea littoral, carrying either bulk or package cargo. The Brunsbüttel class fruit carrier was designed to meet the requirements of German shipping companies for a fast cargo ship capable of carrying perishable fruit cargos from the Caribbean, the Canary Islands and the Iberian Peninsula. Low-stowed cargo simmed as additional bunkers. Actual radius 8,000 nm. The Rosario class has been designed to meet the requirements of the Hamburg-Sudamerikanische Dampfschiffahrts Geselleschaft for a modern, high-capacity refrigerator ship. It is expected that the vessels of this class will be employed on the firm’s routes to the River Plate and other ports in South America; the design is readily adaptable to other trades requiring large refrigerated spaces. In additional to the conventional cargo-handling gear the design can be loaded with packaged cargo via lift trucks utilising side doors. The Allemania class has been designed to meet requirements for fast cargo services on routes to the Far East and to South America. The vessel is classed as a combination ship, with passenger accommodation for sixty-six cabin class, with amenities. It also features significant insulated space for perishable cargo and deep tanks for bulk liquids. Low-stowed cargo simmed as additional bunkers: 2,367 tons of fuel for normal range of 10,000 nm; low-stowed cargo 7,306 tons. The Brasileiro class combination ship was designed by the Deschimag firm to meet Brazilian requirements for modern vessels to supplant the 1920s vintage Ararangua class passenger-freighters employed by the Lloyd Brasileiro. The design features a large cargo capacity fore and aft, with insulated spaces aft for meat or fruit cargos. The designed passenger accommodation for up to three hundred cabin passengers is marked by spacious public areas and amenities. Deep tanks for liquid cargos are also fitted. Low-stowed cargo simmed as additional bunkers. Actual radius 12,000 nm on bunkers of 1,297 tons. Total low-stowed cargo 8,600 tons, including insulated space of 3,600 tons. The Mittelsee class has been proposed to meet the needs of German shipping firms trading to the Mediterranean. It is designed to handle parcels cargo and has strengthened hatches for the carriage of deck cargo when required. Low-stowed cargo simmed as additional bunkers. Radius 10,000 nm on bunkers of 861 tons. Total low-stowed cargo 3,450 tons. The Waldstadt class has been designed by the Neptunwerft of Rostock to meet the requirements of firms engaged in the European timber trades. The design features the engine and accommodation right aft, with a clear foredeck featuring two long hatches and cargo-handling gear carried high to facilitate the handling of deck cargo. The design is specially strengthened to handle outsize deck cargo and is strengthened for ice navigation, required for the northern-most ports of Nordmark and the Russian Federation. Low-stowed cargo simmed as additional bunkers. Normal radius 7,500 nm at 10 knots, with bunkers of 303 tons. Total low-stowed cargo 2,400 tons. The Rio Panuco class has been designed by Bremer Vulkan to meet the needs of German lines trading to the Caribbean basin. While provided with accommodation for two dozen passengers with amenities worthy of larger ships, the Rio Panuco is properly a fast cargo ship, and is fitted to carry mixed cargos outward and fruit cargos homeward. Low-stowed cargo simmed as additional bunkers. Normal radius 8,000 nm on bunkers of 1,549 tons. Available cargo space 6,000 tons. 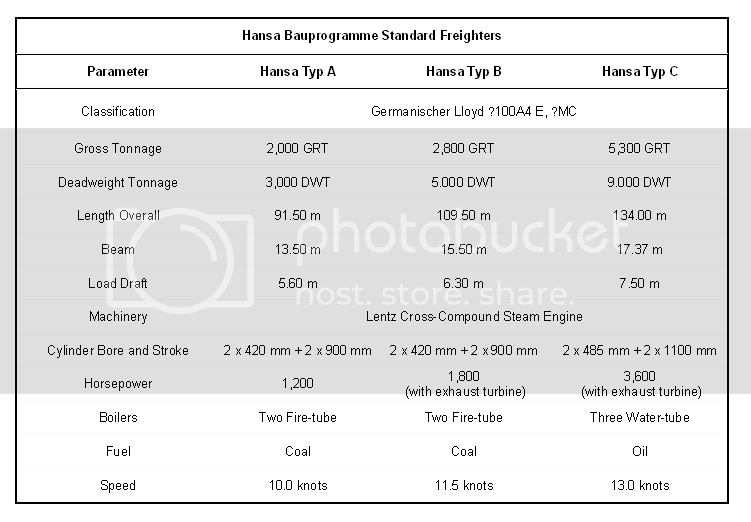 The Weimar class has been designed by Deschimag of Hamburg to meet the requirements of firms engaged in the transport of ore, coal or other bulk cargo. The bridge structure is placed aft, leaving the deck unobstructed for carriage of cargo, and provision is made for extensive cargo-handing equipment to facilitate a quick unloading and turn-around in port. Low-stowed cargo simmed as additional bunkers. Normal radius 13,000 nm at 11 knots, with bunkers of 1,310 tons. Total low-stowed cargo 10,000 tons. Residual composite strength represents strengthened deck combings and structure for carriage of heavy cargos.